Cavi- 4 Plus has been designed for those who want to compete with the big ones and with a small machine you can make beautiful bodies and faces. 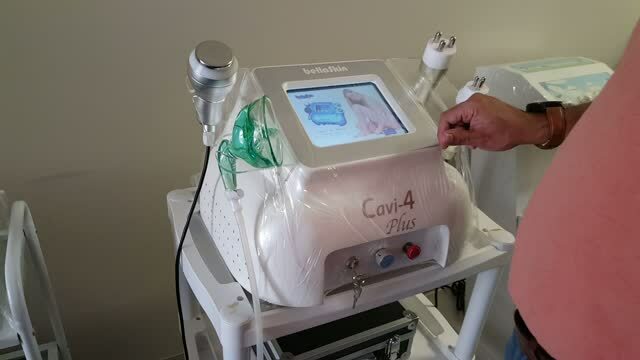 Cavi-4 Plus has many functions like Cavitation , Radio Frequency, Vacuum among others. All the functions have the best parameters to guarantee the results. Cavi-4 Plus , Elite or Advance have a LCD 7.5 “ x 5” screen that shows the main menu to choose the function that you need to use depending of the type of treatment performed, and also comes with a complete set of tools that user will need to complete a real good session like infra thermometer, skin fold caliper , stand table, buttock and body and face cups. CAVITATION is for cellulite exploding which destroys the membrane that keeps trapped the fat cells through powerful ultrasound waves of 40 Khz and 130 watts of power. Monopolar and Tripolar RADIO FREQUENCY technology latest treatment to remove wrinkles, skin lifting and tightening the skin among others . VACUUM absorption is equal to or even better than the effect of manually reduction massage hands , which is able to reshape the whole body, including body lifting, cellulite reduction, and much more. Utilizing focused wave transmitter to project the frequency which reaches 40 KHz of intense sound wave, cavitation causes violent vibration within fatty cell, and results in producing the innumerable vacuum air pocket inside and outside the fatty cell; the fat cell is bombarded with strong force and caused its membrane the introversion demolition. Cavitation option is always suggested to use before to perform radio frequency treatments, always remember that cavitation destroys fat cells and RF tighten them. The Tripolar RF is the latest technology in radio frequency equipments , it is actually very comfortable for people during the treatment, it feels warm and the energy comes out evenly, the treatment results are really better than monopolar or bipolar radio frequency treatments. The fibroblasts are stimulated by the 1 MHz wave, releasing collagen and elastin covering up all those spots which are in need of it. People lost collagen and elastin because of age, or other factors, this treatment is also for acne, pain relief, wrinkles, flabbiness and much more. Cavi-4 Plus and Elite includes one tripolar handle for body, one for face and one extra one "Sixpolar" to cover more body areas in less time. Exclusive Facial Screen for treatments, new images, no need to changed the handles between body and face because each one has its own connector to the machine. Another great feature is "Protocols" ; if you have doubts how to perform the treatment go direct to your support screen for protocols, all is carefully explain it there. Vacuum has a new option to reduce pressure for all those that still do not have experience doing this treatment.